An increasingly large amount of wonder diet pills are hitting the weight loss market all with a similar story to tell. 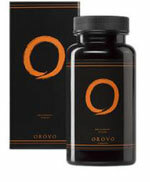 Orovo is the latest in the new breed of diet pills that promise weight loss, beauty and energy. A wonder diet pill that helps weight loss, helps reduce wrinkles and helps reduce acne. Too good to be true? Heard it all before? Orovo markets itself cleverly by including superfoods as its ingredients – but how much is actually included is anyones guess. Orovo is very similar to Lipovox – so much so that it is highly that Orovo is Lipovox but packaged in a rather fetching and trendy blck bottle with an orange circle. Rather than write a full review on Orovo you may as well read the Lipovox Review here as there is so much similarity. Does not produce any serious side effects – this is the one saving grace for Orovo. There have been numerous complaints recieved by us and other diet pill review sites concerning Orovo and Lipovox to suggest that it is not a consumer freindly diet product. WEhcih is kind way of saying that the product does not work and customer service is lousy. Either From The Orovo Official Store or from eBay. It is our strong recommendation to NOT buy Orovo as the most likley scenario is no weight loss, no reduction in wrinkles and very hard task trying to contact the customer service department to ask for a refund.